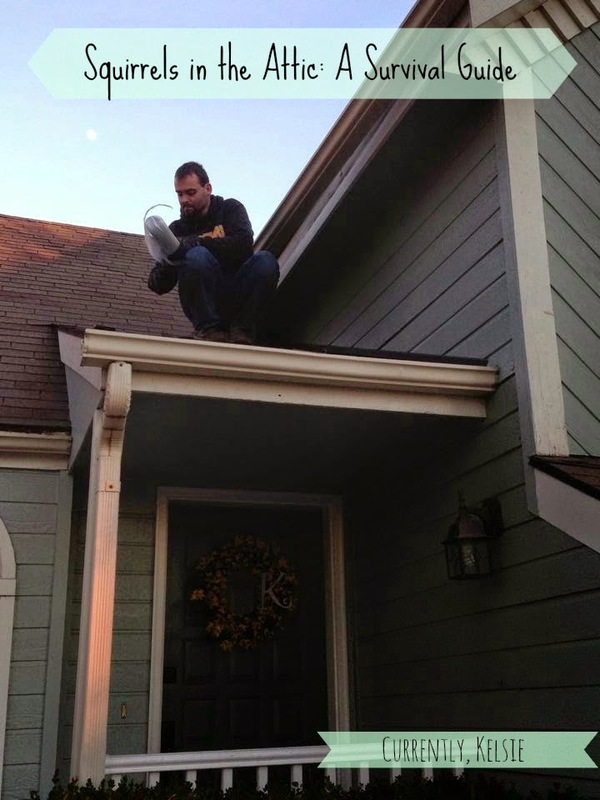 In honor of spring cleaning and the joys of home-ownership, I've put together a small survival guide to offer you guidance on what to do if you find squirrels in the attic. Enjoy. Realize that the strange scratchy sound you're hearing on the ceiling is in fact a live animal. Remove clothes from the closet and figure out how to get into the attic. Prepare the bravest member of your family for entry. Don't forget the baseball bat. Scream loudly and move attic door around so all animals are scared away. Climb through hole into attic and pull self up to look around by iPhone light. Locate hole where squirrels are getting in. Attempt to close hole. If possible, climb on roof to do so. Continue to hear noises. Proceed to step 9. Get poison. Place in attic. Wait. It may take days; it may take weeks. Find dead squirrel on the sidewalk as you are leaving for friend's wedding. Husband is gone, so work up the nerve to grab shovel and flip dead squirrel into your landscaping. Try not to stare at its still open eyes. Smell strange smell in house. Go into attic for recon. Have bravest member find dead squirrel and hand down in plastic bag to partner waiting below. Throw away, while trying not to think about the fact that you're holding a dead squirrel. And yes, this was a true story. Happy home ownership!